Journal of the Society for American Music (2015), Volume 9, Number 1, pp. 152-156. My God! What fantastic piano music this is! ….It’s perhaps the year’s most exciting piano music discovery. Arthur Foote – as becomes apparent here – was no less than a supremely gifted composer when it came to the piano….Even the most narrow-minded of purists may well allow themselves to be quite beside themselves with enthusiasm over this 3-CD set, in which both interpretation and recorded sound are also absolutely impeccable. Even more: Kirsten Johnson is a complete pianist, with magnificent technique and enormous artistic personality. ….Foote has a worthy champion in Kirsten Johnson, whose lovely sound and exquisite phrasing allow her to quickly locate the lyrical heart of a melody and invest it with pure streams of colour; Johnson makes a particularly persuasive case for the Five Bagatelles, Op 34, including a hypnotic, Chopin-influenced ‘Without haste, without rest’, a radiant ‘Idyl’ and a concluding ‘Valse peu dansante’, a total charmer. Johnson is similarly at her best in the 17-minute Five Poems after Omar Khayyam, Op 41, in the space of which she lets herself be seduced by rolling waves of chords alternating with light Brahmsian lyricism, occasionally leavened by some gentle, deep emotion at the music’s heart, and even touched briefly by an epigrammatic wit worthy of Satie…. Where has this delightful, well-crafted, thoroughly idiomatic, tuneful (though harmonically conservative), and unpretentious piano music been for the past century? Listen to any piece at random, blindfolded, and you’ll agree, although you’ll be hard-pressed to identify the composer. Unknown Brahms? Meatier than usual Mendelssohn? Or Richard Strauss as a prodigious teenager? Not Schumann—the piano writing is not crazy enough—but there’s that same rumbling energy…. The mystery man turns out to be the Boston-based American composer Arthur William Foote (1853-1937)…. Because most of these works have been out of print for decades, pianist and longtime keyboard rarity advocate Kirsten Johnson had to do considerable detective work in order to obtain the scores. More importantly, she appears to have put in comparable practice hours, borne out by her consistently sonorous virtuosity and tasteful musicianship, abetted by a first-rate Steinway grand and an appropriately resonant yet never muddy recording venue. A major addition to the catalog. The piano music of Arthur Foote comprises perhaps the least known branch of his output. We are indebted to the enterprising Kirsten Johnson for recording it complete for the first time. Naturally many of these pieces are world premieres…. One of the major discoveries of this set is the Serenade Op. 45. Though seemingly slight, the five pieces of this suite show the composer at his most genial and even endearing. In some ways it is a musical counterpart to Foote’s charming autobiography (Plimpton Press, 1946). The much later 5 Silhouettes is more dramatic – with a Prelude reminiscent of those of Op. 15 and Op. 30. This is followed by Dusk – a variation on the Prelude’s musical material with a notable conclusion…. Having recorded all of the piano music of Foote’ colleague Amy Beach, Kirsten Johnson is eminently qualified to provide us with idiomatic accounts of Foote’s music. She shows special sensitivity to the composer’s brand of restrained emotion – moderately expressing the underlying feeling as the composer himself would have wanted. Ms. Johnson has a bright tone which is ideal for Foote’s out-of-doors works and enough sense of fantasy for Omar Khayyam…. Ms. Johnson’s discs are highly to be commended both for bringing us some wonderful music and as another milestone in the rediscovery of America’s early musical heritage. The Listener, September 23, 2013 www.the-listener.de. Our second “exceptional CD” for the month of September is – in my opinion – one of the discoveries of the year thus far … and in every respect. Here we have not only wonderful music that’s well worth discovering, but also an outstanding interpreter: one who deserves stronger focus from the musical press. Let’s begin with the artist: Kirsten Johnson has given us an impressive series of fabulous CD recordings, mostly for Guild: the British mini-label. In these she has shown a great spirit of discovery – as in her album of Albanian piano music; likewise the piano works of Amy Beach and Heinrich Schulz-Beuthen. Her enchanting phrasing combines with her breathtakingly soulful delivery to produce tremendous emotional impact. Kirsten Johnson breathes life into her music. Her performances are genuine happenings: never mere “jobs” done for some CD label…. But what we have in Foote’s piano oeuvre is worthy of far more than just the polite applause of passing recognition….With every note, Johnson shows her enthusiasm for these wondrously beautiful piano compositions that appear to bear the latter-day influence of Frédéric Chopin and John Field…. In a nutshell, this fascinating 3-CD set is very close to the top of our short list of possible choices for The Listener’s “CD of the Year.” I think it’s safe to say that this album will continue to maintain its lofty position on our list of choices through to the year’s end. 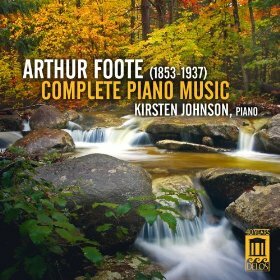 It’s not often that you audition a recording where the artist is far greater than the composer, but that is exactly the case with this massive set of the complete piano music of Arthur Foote (1853–1937)….